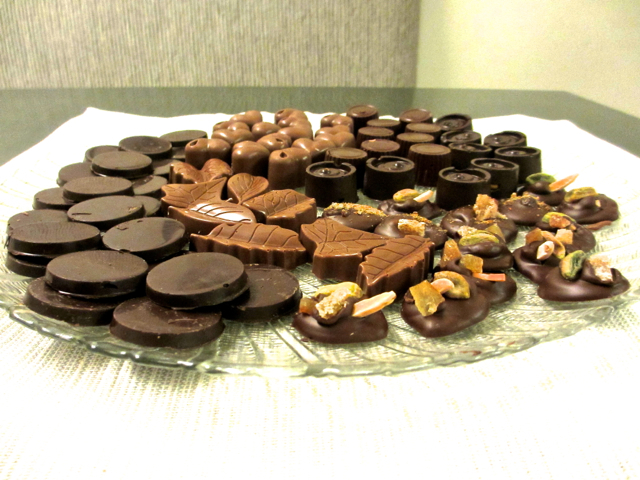 My friend Paul came over for one of our periodic chocolate-making afternoons yesterday. As usual, we tried a number of different chocolates: Valhrona Manjari 64%, Callebaut Bittersweet (unspecified percentage cacao) and Callebaut Milk Chocolate (also unspecified) and made a bunch of different shapes, including mendiants as well as six or seven molded shapes. 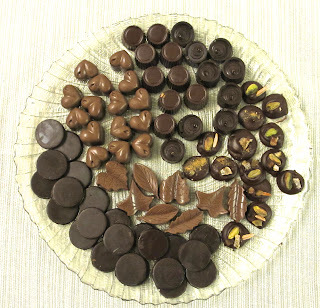 The challenging part of chocolate-making is tempering the chocolate, to get a snappy, shiny result. This involves slowly melting the chocolate, cooling it to 84°F (81°F for milk chocolate), then bringing it to 90°F (86°F for milk chocolate) and holding it pending use. With a good thermometer, it's not hard to hit the right marks, but it is exceedingly hard to keep the tempered chocolate at 90°F. This matters a lot, because if the temperature drops, it is hard to work with the chocolate. A note on chocolate. The easier dark chocolate to use was the Valhrona Manjari, which also has wonderful compexity and spiciness. The Callebaut Bittersweet has a rich super-chocolaty taste that we really love but is tricky to use; we believe it has a cacao content in excess of 70%, which would suggest using slightly higher temperatures than for the Manjari. Next time we are planning to use Callebaut and Barry Venezuela 72%, which I bought in Paris, and go with a low temperature of 86°F and a holding temperature of 93°F. Since J cannot eat beef, but still likes burgers (as do I), I am always looking for burgers made with other meats: lamb, veal, turkey and ostrich. Over the years I have tried many lamb burger recipes and have developed my own, which I think is worth sharing. These are perfect for bowl games (we had them last night while watching the Rose Bowl) and for the pro football post-season. 2. Finely chop shallots and garlic. Saute in a little olive oil until soft. 3. Mix lamb with shallots and garlic, parsley and bread crumbs. Form patties. Fold cheeses into middle and surround with meat. 4. Heat canola oil in cast iron (or other heavy bottomed) skillet. Season meat with salt and pepper and sear in pan for about 3-4 minutes. Turn meat and put skillet in oven until done to taste. Another 3-5 minutes for medium-rare. 5. In the meantime, heat slices of ciabatta or rolls. Best is on a grill pan until browned, but a toaster would be OK, as would be the oven where the meat is cooking. 6. Put a burger on top of ciabatta slice, top (or bottom) with tomato slices, onion slices and, if using, jalapenos. Either add lettuce leaves or accompany with lightly dressed greens. 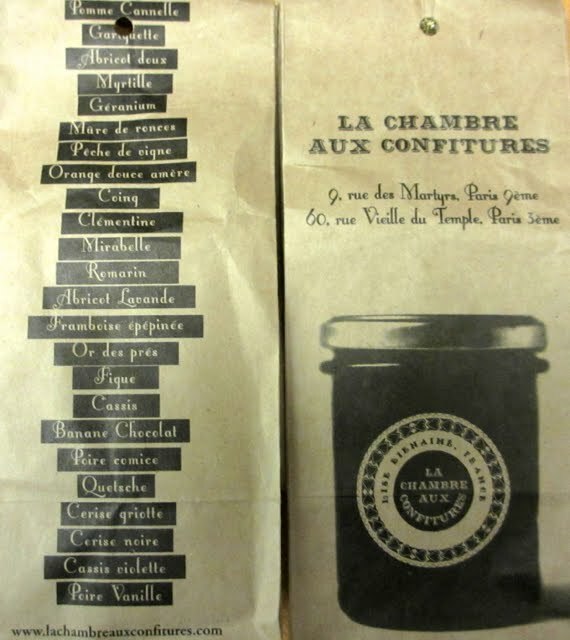 Last week J and I happened upon a new place in the Marais called La Chambre aux Confitures, which sells preserves, conserves, chutneys and jellies made by Lise Bienaimé, whose great-grandfather made and sold preserves in Paris many years ago. 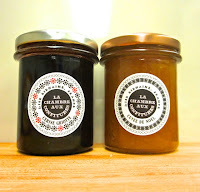 We sampled a large number of her preserves, and they are interestingly composed and with a softer texture than is common for preserves: utterly delightful. We ended up buying the "Cuvee de Noël," apricot jam flavored with pain d'épices spices, and Cerise Griotte, a loose morello cherry preserve, both excellent examples of Mme Bienaimé's special touch. 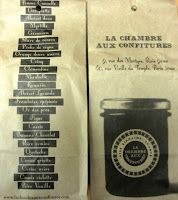 The shop we went to was at 60, rue Vielle du Temple, in the 3rd; there is another at 9, rue des Martyrs in the 9th. Their products are perfect gift items as well as treats for yourself.